Tree pose is one of the 26 postures of Bikram yoga. 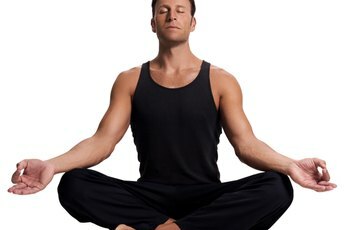 Both Bikram and power yoga have their roots in Hatha yoga, which consists of 26 postures and incorporates breathing techniques into the practice. 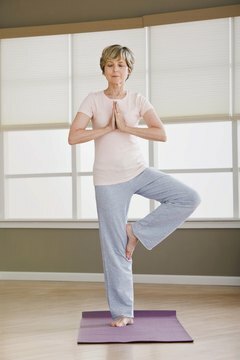 The styles are considered by some to be two of the most challenging forms of yoga. Though they share the same basis and some similarities, the two styles have some key differences. Power yoga is a general term that describes a fitness-based approach to vinyasa yoga, and is closely modeled on Ashtanga yoga. In power yoga, poses are held longer and are performed in a continuous flow. The postures are designed to build strength and control, as well as flexibility. It is most often credited to Beryl Bender Birch, a New York yoga teacher, and Bryan Kest, a Los Angeles yoga teacher. Both teachers studied with Ashtanga yoga master Sri K. Pattabhi Jois. Power yoga combines three concepts: vinyasa, which refers to breathing and flowing from one posture to the next; tristhana, which refers to three places of attention; and internal purification, which refers to "burning away" anger, desire, greed, envy, laziness and delusion. It can be performed as "hot" yoga, or at room temperature. Bikram yoga was founded by Bikram Choudhury and is a form of Hatha yoga. It is a type of "hot" yoga, meaning it is practiced in a heated studio, typically at a temperature of 105 degrees Fahrenheit. It consists of a sequence of 26 postures, and classes last for 90 minutes. Over time it helps improve muscle tone and flexibility and also helps build strength. Choudhury claims the high temperature helps detoxify the body . Proper hydration is essential for anyone taking a power or Bikram yoga class. Be sure to drink plenty of water before, during and after a class to prevent overheating and dehydration. It is also a good idea to have as much bare skin as possible; the sweat will help prevent overheating. Before beginning a power or Bikram yoga, it is important that practitioners know their fitness level. Attempting advanced postures before you are ready can be dangerous and lead to serious injury. It is a good idea to take an introductory or beginner's class if starting yoga for the first time, or if switching from a different style. IDEA Fit: What Is Power Yoga?